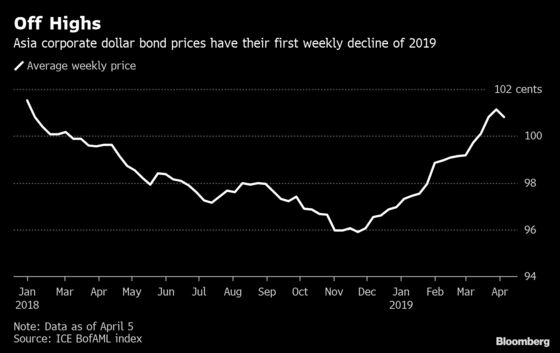 (Bloomberg) -- Asia dollar bonds still hold appeal after the strongest rally in nearly a decade as funding conditions in China improve, according to Goldman Sachs Asset Management. China’s deleveraging push that helped trigger defaults in the dollar bond market last year is now taking a back seat, and its stimulus measures have boosted onshore liquidity for borrowers, according to Niaz. The nation’s economy has already bottomed and growth will pick up in coming quarters as corporate tax cuts boost the private sector, HSBC Holdings Plc economists wrote in a note this week. Goldman Sachs Asset Management adds to global investors, from BlackRock Inc. to HSBC Private Bank, that remain positive on the asset class as credit conditions in Asia remain stable. It’s constructive on Chinese high-yield notes, including property bonds, and sees value in select Chinese investment-grade borrowers. Outside of China, the fund manager prefers investment-grade notes from Indonesia over lower quality junk issuance from the nation. Niaz is more watchful of the risks and outcome from the Indian election, where the result is less predictable than for Indonesia, he said. Both nations go to the polls this month.